Making Brussel sprouts always seems to upgrade a meal. I'm not sure if it is just that I don't throw them in the microwave like so many vegetables, or if they're cooked rather than just tossing a salad, but they feel "fancy". These take maybe 10 minutes from start to finish, and serve 2-4, depending on portion sizes. -fresh Brussel sprouts, 8-10 oz. First, you will want to slightly steam your brussel sprouts to make sure you end up with a tender final product. I bought a heat-in-the-bag type from Trader Joe's and I popped it in the microwave for two minutes. 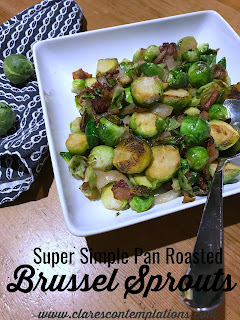 If you prefer, you can also bring an inch or so of water to a boil in a saucepan and steam the brussel sprouts covered for two minutes until they are bright green. Cut sprouts in half. Since I don't prefer to cook raw bacon, I use the pre-cooked kind. It is easy to cut the slices into strip with my kitchen shears. I cut them right over my skillet. Cook the bacon until it begins to crisp-you don't need to cook it to done, as it will continue to cook with the sprouts and onions. Depending on how fatty your bacon is, you will want to add 1/2 to 1 tbsp. of butter. Immediately add the onions. Saute briefly, about one minute. Add the sprouts. Cook until the bacon is crispy, the onions are translucent and the sprouts are nicely browned, stirring occassionally. You can add salt and pepper, as you cook, or after. Sometimes I add a little garlic salt. That's it! 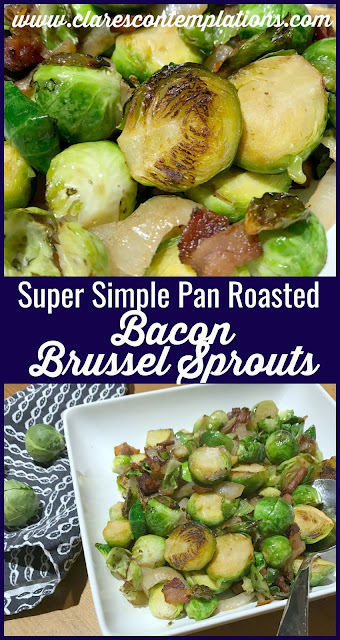 A super simple, healthy, "fancy" side? That's a big "yes" for me! We love to eat these with roasted pork tenderloin, steak, or grilled chicken. They're pretty good with almost anything. So, go! Eat brussel sprouts and feel fancy!